A wide range of cycle times (from 6 seconds to 288 minutes) and standard cams make this timer ideal for many continuous cycle applications. 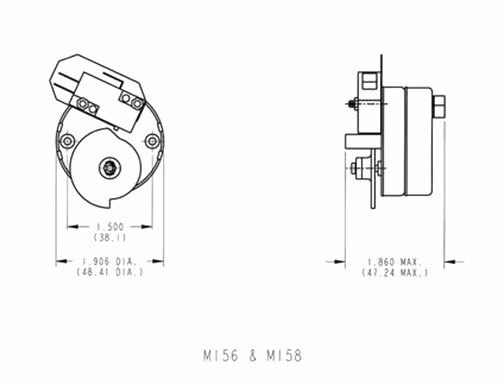 A single cam and switch is standard (M156). A two cam configuration (M158) is available if additional switching capability is needed. Available switch configurations are single-pole single-throw (SPST) or single-pole double throw (SPDT) utilizing 15 ampere "snap action" switches. Common applications include food processing equipment and heat pumps. Midwest Timer specializes in large orders of electromechanical timers. Contact Midwest Timer today for more information. 187" (4.75) male spade with .250" (6.35) terminals optional. Cycle times ranging from 6 seconds to 288 minutes are available. Heat pumps, food processing equipment.